Are Fake Families Really On the Rise At Border Crossings? “Again, let’s just pause to think about this statistic: 314 percent increase in adults showing up with kids that are not a family unit,” she said. “Those are traffickers, those are smugglers, that is MS-13, those are criminals, those are abusers.”…A DHS representative provided The Washington Post with the hard numbers behind Nielsen’s statistic. There were 46 cases of fraud — “individuals using minors to pose as fake family units” — in fiscal 2017, the period from October 2016 through September 2017. In the first five months of 2018, there were 191 cases. That is an increase of 315 percent. This is kind of weird. That’s not an increase of 315 percent. On a monthly basis, which is all that matters, it’s an increase from 3.8/month to 38.2/month. That’s an increase of 905 percent. Why wouldn’t the Trumpies use this bigger, more dramatic number? Needless to say, my spidey sense began tingling—both because the real number is so gigantic and because the Trump administration didn’t use it. Why? They usually love gigantic numbers. Virtually all the prosecutions are for an attempted reentry by someone previously deported. The only category that’s both relevant to “individuals using minors to pose as fake family units” and big enough to include 38 charges per month is the second one, 08 USC 1324. What does that look like over time? Nothing seems to be happening here. It’s about the same as it’s always been. I may be totally off base here, looking at the wrong thing. That said, the usual criticism of the 315 percent number is that it represents an increase from a tiny base, which makes it sort of meaningless. But I have a different question: What do prosecutions for “individuals using minors to pose as fake family units” look like over time? Is the number really rising? 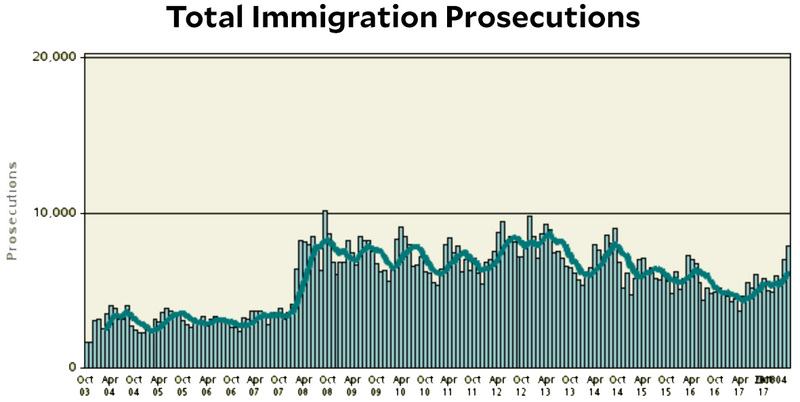 Is it rising because prosecutors have been told to prioritize it, or because human smuggling is really on the increase? If DHS can provide the 315 percent number, I assume they can provide the number for every month over the past decade. I’d like to see that.